Besides making ham and pineapple sandwiches, Ham Salad is my favorite way to use up leftover ham. 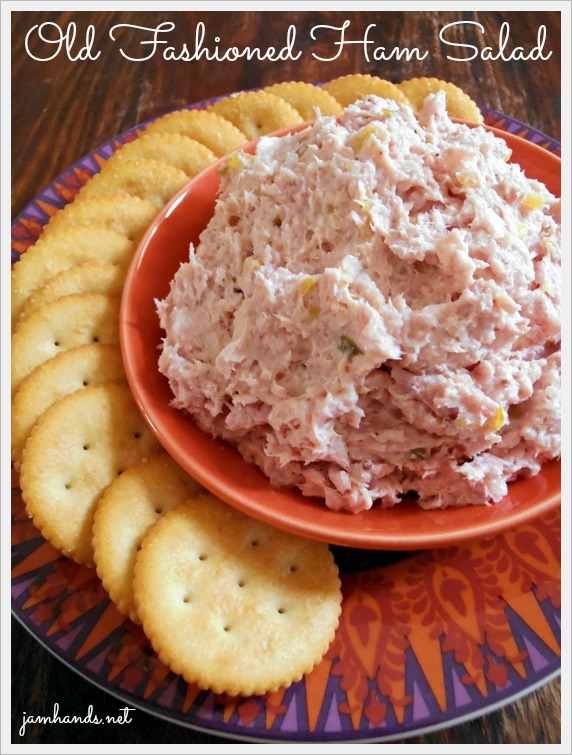 For a delicious treat, serve this Ham Salad with butter crackers and slices of Swiss cheese. It is crazy delicious. Enjoy! 1. Dice the ham into small 1/2" cubes. Add all of the remaining ingredients except for the relish to a food processor and pulse until chunky. (You want it to be smooth enough to spread on crackers, but not so smooth that it becomes a paste. Check every few pulses and watch closely to get the desired consistency). 2. Transfer the spread to a mixing bowl and stir in relish. Serve with crackers and Swiss cheese. OH THANK YOU! 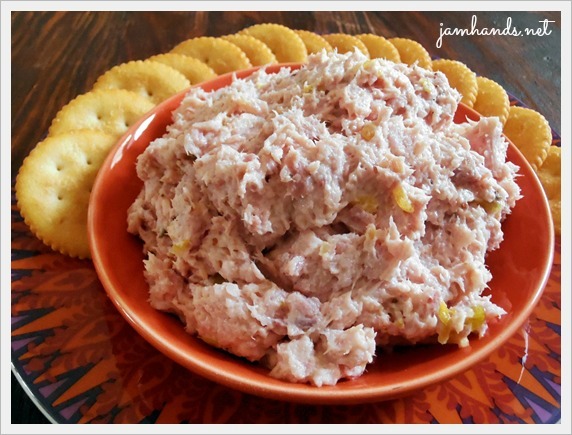 I just love ham salad but I don't have a good recipe so it ends up being one of those things I love eating at a potluck, then I buy it at the grocery store and it tastes terrible! Now, I can make it with leftover ham Sunday night! Perfect. This was wonderful! I just made it with all that left over ham from Easter and served it with deviled eggs and crostini. A great light meal! Can't wait to try this! (ham is oven now) My mother used to make this when we were kids (50+ years ago) but she used bologna. Being a single mom with 4 little kids, she cut corners every way she could. We LOVED IT!!! Thank you for this recipe! I love good old fashioned recipes. I haven't had or made ham salad in years. Thanks for the reminder. This recipe is like mine. Thank you. My folks used to make ham salad and sell it in our small grocery store 60 years ago. I also used to make it for my kids using big bologna over 50 years ago. The kids especially liked when I spread the salad on left over hamburger bun halves, topped with cheese and put under the broiler. It was a real treat. When we were kids, we couldn't afford ham, so our "ham" salad was made with chunk bologna put through the old crank grinder. It was delicious! All mom added to the bologna was miracle whip and sweet relish, though. Made this today, first time in my life making ham salad. Delicious! Used dill pickle relish b/c that's what I had, loved it. I'll definitely make this my "go-to" recipe. Thank you for sharing. Love ham salad. Next time I make this I think I'll add a little of the leftover pineapple...yum! Thanks! I'm not a fan of Miracle Whip - ok to sub-in reg mayo instead? Sure. The taste will be a bit different with no miracle whip, so just taste for seasoning and see if you think it needs anything extra. I remember going to my friends house as a kid and they had this delicious ham salad and it was sooo good on toasted white bread! Unbelievably good. I am going to make this for my family. I just forgot about it! I have never had ham salad, but it looks delicious. My mom used to grind up her ham to make ham croquettes. Did them just like salmon croquettes, but she switched the salmon for ham. Loved them growing up.